Drawing a cartoon fruit: some fun facts before starting sketching! Bananas are the most popular fruits in the US. Looking for fat, cholesterol or sodium? Sorry! Bananas don't have those! However, bananas are high in sugar. Why not try to draw a nice yellow fruit! Yes! A banana! Since this is one very popular fruit, you should not have a lot of trouble finding a real one to serve as a model. If it's impossible, then take a look at the one on your left! Notice the texture (2) of the banana, the color (4) and the general shape of this exotic fruit. This example might be a little tough to draw since it is half-peeled. 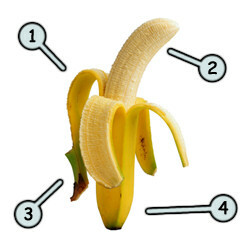 The skin is made of some oval shapes while the body of the banana looks like a "C". Notice how the sense of depth has been created only with a small change in the color of the skin. Ok. Now it's time to draw our funny banana! Start with three basic shapes. Two triangles and one rectangle. Next, work a little bit the outline of your banana. Then, add some eyes and draw the teeth. Finally, add a small line in the middle to give more depth to your banana. Also, make sure that you did erase the small line near the teeth (between the 4th and 5th image) to make them more visible. Once again, it's up to you to choose what kind of banana you wish to draw! Will it be a simple one (3)? Or will you try a funny one (1)? 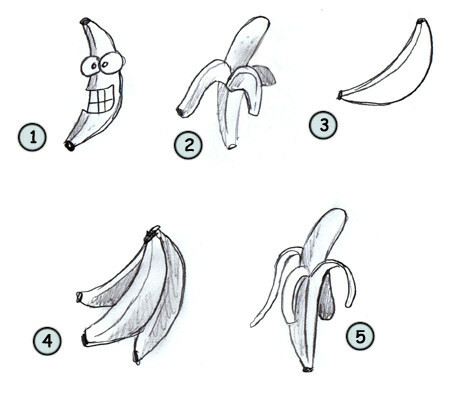 Or perhaps you prefer to draw a more realistic banana (2,5,4)? Don't hesitate to take a real model and to play with it! Have fun!